You will need a 1 gallon container for the primary fermentation, and enough empty bottles for bottling. I used a combination of grolsch bottles, beer bottles, and wine bottles that I had lying around. As for the primary fermenter, I used a thoroughly cleaned and sanitized gallon cider container, left over from my cider experiment. The balloon and needle were used as a stopcock/airlock. Sanitization is up to you. You can use the suggested chlorine sanitizer, or any other sanitization method you know of. Just keep in mind that this is the most important step for making a drinkable mead. Also recommended are a fermentation bucket with stopcock and spout, a racking cane, and a bottling wand. Depending on how you plan to bottle, a capper or corker may be necessary. Using a grolsch (or beugel) type bottle will eliminate the need for these. All these items, as well as the tubing and yeast can be found at your local homebrew store. The yeast that's used in this process doesn't have a great affinity for the sugars in honey, hence we'll be using a juice concentrate to kickstart the process. You can also buy a yeast nutrient and add to the must. Sanitize Everything. Be sure all buckets, tools, utensils, etc. are thoroughly sanitized. Bring 3qts water to a boil, then turn the heat down to a simmer. Add Honey and Juice Concentrate while stirring continuously until dissolved. Avoid boiling this mixture (known as a 'must'). Remove from heat and cover brewpot while allowing to cool. Once the brewpot is warm to the touch, add yeast and transfer must into 1 gallon primary fermenter (gallon jug?). Cover with airlock (a balloon stretched over the opening with a needle hole poked into it works like a charm). Allow to sit at room temperature for 3-4 weeks to ferment. Once primary fermentation cedes (no more bubbling/deflated balloon) transfer the mead from the fermenter into bottles. 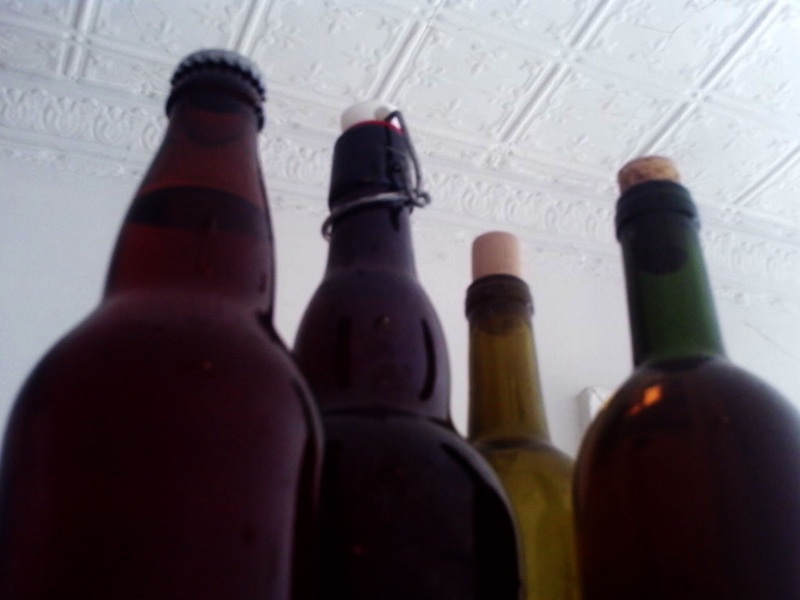 I used some plastic tubing with a bottling wand and siphoned the mead into separate bottles. If you're using a gallon bottle, siphoning from the fermenter into the bottle should be all you need. Just be careful to avoid any sediment. Cap your bottles (using any of the methods mentioned earlier) and allow to sit for 2-4 months.